St. Bartholomew the Great has a rich and interesting history, founded as an Augustinian priory in 1123 by Rahere, it was built when Henry I, son of William the Conqueror, was King of England and it possesses the most significant Norman interior in London.It survived the Great Fire of 1666 and the bombs dropped in Zeppelin raids in World War I and the Blitz in World War II. 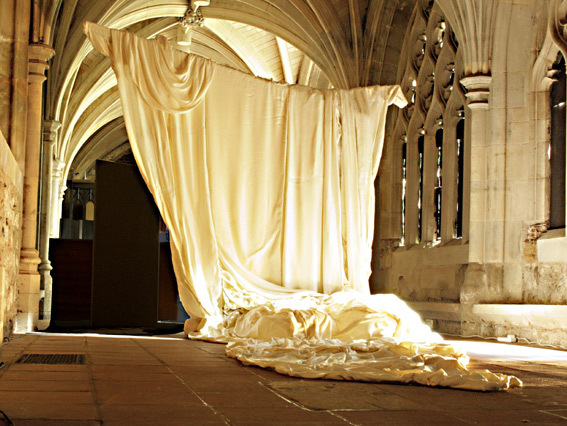 In July 2007 Maxwell was invited to create an installation in the Cloister area of the Church of St. Bartholomew the Great, West Smithfield , London. Using materials often found in churches, Maxwell created a large shroud like freestanding sculpture made of over 100kgs of candle wax. The installation took place within the cloister and took two weeks to complete.